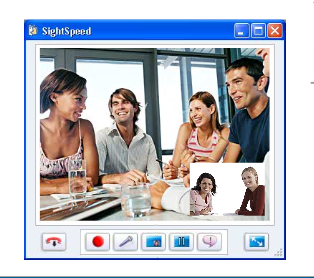 The picture from the right is a screenshot for SightSpeed, some sort of video chat thingy I read about on Mashable. Yawn. But check out the screenshot and tell me if you share my reaction to the cheery ensemble—namely, a strong desire to drown the lot of them or—if that pleasure is denied me—to banish the window as fast as possible. A bunch of gorgeous 20-something actors* playing “office,” sipping water, sitting too close together and laughing—is there anything more odious? Will somebody older and uglier please barge in and fire these flesh mannequins? Does anyone see this and see anything other than money wasted and good-looking people pretending? Does this stuff still work on the internet? Aren’t we beyond this? I was hoping to tie this into LibraryThing’s heroic avoidance of little square profile pictures, of the home page festooned with bibliophile hotties, of book website clip art of attractive non-readers reading in unlikely poses. But you get the picture. *There remains the possibility that these people actually work for SightSpeed—engineers, systems administrators and so forth. If so, can I short this company?